KUWAIT: A majority of Filipino workers in Kuwait are not willing to gamble their future amid a diplomatic row between the Philippines and Kuwait. Philippine President Rodrigo Duterte has called on Filipinos to return home and show patriotism. “We cannot eat patriotism,” said Edith (not her real name). “I fully support him, but unless we are provided decent high-paying jobs, I cannot go back just because he says so,” she said. Edith, 55, is a nurse who works in a clinic in Kuwait, and will retire in a few years. “I will retire and go back home on my own timeframe. I have been cared for and pampered here in Kuwait for many years, so why turn back on them,” she said. Bok-bok, also a nurse, said he is willing to go home if the government in the Philippines is able to provide a similar salary he is receiving here. “Come on, how can the sins of a few people in the Department of Foreign Affairs be burdened by all of us? Duterte should fire those people involved in the video fiasco. They knew they were breaking the laws of Kuwait, and should be punished for doing so,” he said. Alex, another Filipino worker in Kuwait, is more knowledgeable on what allegedly transpired with the community before the videos were posted on social media. “Remember that everything started not because of this video,” he said. “It started because the president wants the protection for our workers. We should not deviate from the real story. He had cited the growing number of alleged suicides, mistreatment and abuses – these are the real issues here,” he pointed out. “Why we focus on those videos? The rescues happened because apparently there are housemaids that are being mistreated and need help. Those people that were involved in rescues were Filipinos and they did what they did because they were in extreme danger. It is their sworn duty as embassy officials to protect and care for Filipinos. The breach of laws was very regrettable, but if you listen to them carefully, they said they informed authorities here but did not act quickly, so they did it on their own. At least they informed authorities here,” Alex said. “The Philippines apologized and Kuwait accepted it, but still expelled our ambassador,” he said. “This is the reason why our president is furious. Kuwait has the right to do so, but at least they should be cautious. The Philippines did not ask for an apology for the deaths and mistreatment – we deserved it too,” he said. Larry, a Filipino aircraft maintenance engineer, said he will not leave Kuwait, since he has taken a 1.3 million peso loan from a local bank. “I will have to pay all my obligations before I go. If Duterte is willing to pay this amount, I will immediately go home – even tomorrow. But I have two more years to repay this amount,” he said. On Sunday, Deputy Foreign Minister Khaled Al-Jarallah affirmed that Kuwait rejects any breach of sovereignty or laws and is ready to act decisively against any relevant attempt. Jarallah, reacting to remarks by Philippine President Rodrigo Duterte, said Kuwait was ready to cooperate with Manila to explore all means to address labor issues, including 800 Filipino citizens who are currently in shelters. Also on Sunday, Duterte said the temporary ban on Filipinos going to work in Kuwait is now permanent, intensifying the diplomatic standoff over the treatment of migrant workers in the state. Duterte in February prohibited workers heading to Kuwait following the murder of a Filipina maid whose body was found stuffed in her employer’s freezer. The resulting row deepened after Kuwaiti authorities last week ordered Manila’s envoy to leave the country over videos of Philippine embassy staff helping workers in Kuwait flee allegedly abusive employers. The two nations had been negotiating a labor deal that Philippine officials said could result in the lifting of the temporary ban but the recent escalation in tensions has put an agreement in doubt. “The ban stays permanently. There will be no more recruitment for especially domestic helpers. No more,” Duterte told reporters in his hometown in the southern city of Davao. Speaking after a meeting held by Kuwaiti authorities yesterday regarding the row, Jarallah said Kuwait is keen on maintaining the safety and rights of all expatriates including the Filipino community within the labor laws of the country, which have been praised by international human rights agencies. He appreciated the contributions of Filipinos, who are working in different sectors. Jarallah said Kuwait shared Duterte’s desire to maintain deeply-rooted relations, citing Manila’s support of Kuwait during the 1990-91 Iraqi invasion. He said “the historic friendship” between the two countries “could help overcome this exceptional circumstance”. Jarallah said Kuwait was looking forward to working with the Philippines to honoring mutual interest. 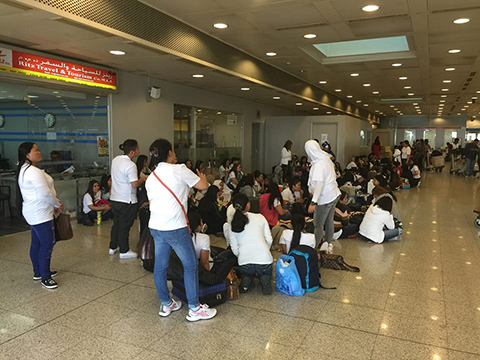 Around 262,000 Filipinos work in Kuwait, nearly 60 percent of them domestic workers, according to the Philippines’ foreign ministry. Last week the Philippines apologized over the rescue videos but Kuwaiti officials announced they were expelling Manila’s ambassador and recalling their own envoy from the Southeast Asian nation. Kuwait also detained four Filipinos hired by the Philippine embassy and issued arrest warrants against three diplomatic personnel, Manila said. About 10 million Filipinos work abroad, seeking high-paying jobs they are unable to find at home, and their remittances are a major pillar of the Philippine economy. The Philippine government has for decades hailed overseas workers as modern heroes but advocacy groups have highlighted the social cost of migration, tearing families apart and making Filipinos vulnerable to abuse.